When I started thinking about a data center I had to try and find some lines to slice it along to try and make sense to the world. Here’s how I did it. 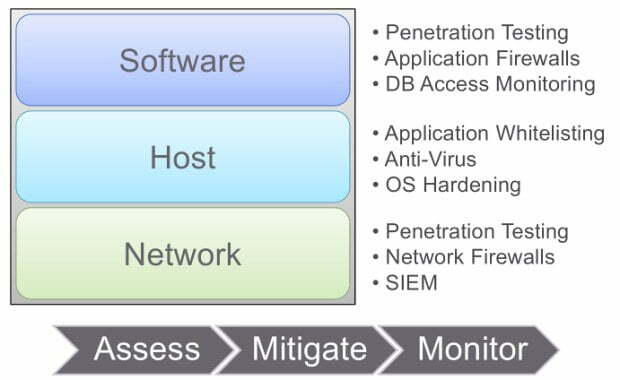 I started thinking about the data center in 3 tiers: the Network, where the security people are concerned about the network firewall, the penetration test, or a SIEM (security information and event management) system. Then there’s the Host, where you want to make sure that the right code is running; if you have to run anti-virus, do that; and you’re concerned about locking that operating system down. At the top of this stack, we’re worried about the software – that’s where the business process is implemented; maybe you do penetration testing or maybe you use an application firewall, perhaps you’re securing the database. There are 3 major activities that we see here. First, assessement – is that system vulnerable? If so, how? Second, mitigation – where there are vulnerabilities, we want to provide some sort of reason to think things are going to be okay. And lastly, monitoring, where we want to know what is actually happening to that system in real time as it’s running. The network layer is probably the most mature market, where assessment, mitigation and monitoring have their own vendors who offer solutions that make sense for the problem they’re trying to solve. 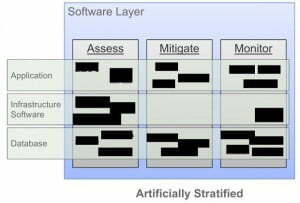 At the host layer, the situation is maybe not quite as stable as at the network layer, but similarly mature, where we have silos of assessment, mitigation and monitoring. At the software layer, the story is a little different. Before I can show you the slide with the software layer described, I have to talk a little bit about what the software layer is composed of. At the bottom, we’ve got the data store – usually a relational database these days. In the middle, we’ve got the infrastructure software – the middleware, maybe an application server, maybe the SAP server. And at the top, we’ve got the applications – maybe they’re custom-written in ABAP, maybe you’ve outsourced them, maybe you’re bringing in some open source. But you’ve got to tie all of these layers together in order to get a working system. So, you’re going to have to use your imagination to fill in who I’m talking about when I’m talking about assessment at the application layer or monitoring at the database layer. The one thing I can say for sure about the slide – you can tell even with the black marks on there – is that mitigating vulnerabilities in infrastructure software is kind of a green field, so if you’re looking to start a new company, maybe that’s the place to go. Alright, what’s bad about this picture? Well, what does it look like when you deploy it? Here’s the security team, with a whole bunch of stuff going on. 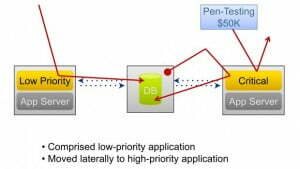 It all ought to look pretty familiar: there’s maybe somebody protecting the software from the network layer; there’s somebody else running a penetration test against that software; yet another person worried about what’s going on on the host, looking at application on it; and somebody else worried about protecting the data store. That’s a bad deal. Why is it such a bad deal? It doesn’t work so well. For this I’m going to tell two stories. Here’s the first one. Here’s a social website; it’s an online dating site (see diagram). Here’s what they did. They had some penetration testers come in; they tested the app, they said: “Yeah, you know, things look good.” They said: “Hmm, we’re still a little nervous, let’s encrypt the database.” And they encrypted the database, too. And then they got hacked. How did they get hacked? Well, it turns out that the user interface and the web services weren’t quite so monolithic. 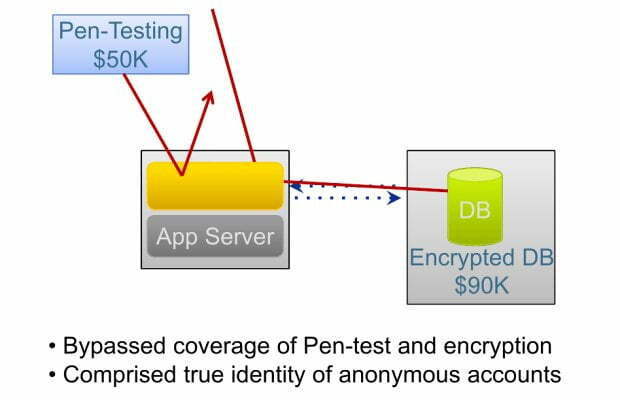 The penetration testers tested the user interface – the attackers went after the web services. What happened? Well, because the attackers came in through the web services, the database encryption didn’t matter at all; and they compromised the identity of every real individual in that online dating site. Next scenario: payment processor – this one was more public, you could probably guess the name if you put your mind to it (right-hand image). 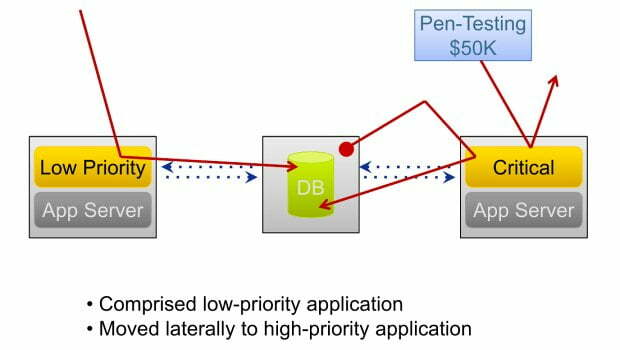 Again, the penetration testers come in, they test the critical app, they say: “Critical app – looking good!” The attackers come in through the low priority app into the same data store. They get into that data store, they still can’t get to the critical app, but guess what – the critical app trusts the database, so they go from the data store to the critical app, and then back into the data store in order to extract all the transactions from the system. And that’s the anatomy of a major payment processor breach from a couple of years back. Software Security: The Big Picture. Part 1. Software Security: The Big Picture. Part 3.